Musician, author and educator, Mildred Landecker possesses a keen mind and a relish for spinning a compelling story. Nearly 100 years of joyful living has provided ample material. Trained at the Juilliard School of Music, Mildred received a Bachelor of Science degree at age 18, and a Masters of Arts degree at age19 from New York University. Her ambition for a career was driven partly by a desire to relieve her mother from being a sole source of support. 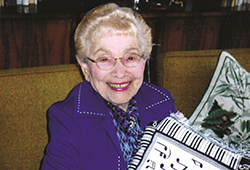 Subsequently Mildred spent 35 years as music instructor at the famous High School of Music and Art in New York City and 30 years as associate instructor at Saddleback College's Emeritus Institute where she was twice awarded "Teacher of the Year." She has taught thousands of students, many of whom keep in touch. Mildred has a particular fondness for Saddleback Memorial Medical Center where her late husband, Dr. Louis Landecker was treated during his battle with ALS (also Known as Lou Gehrig's disease) and where her mother helped with fundraising efforts. When developing her estate plan, Mildred wanted to shield her son, Peter, from a sizeable tax burden while also making a charitable bequest. One solution was a charitable lead trust to benefit Saddleback Memorial Foundation. The funds were dedicated to the Critical Care Pavilion where a plaque dedicated to the memory of her husband is featured. "The hospital always needs money," she explained. "Medicare and private insurance don't cover all the costs, so donations are important to maintain the high standard of care." With a charitable lead trust, Mildred satisfied both desires—a legacy for her family and for Saddleback Memorial Medical Center.